My summer programming was different from my normal school year programming in two ways: I had an outdoor storytime in addition to our regular indoor storytime, and I included one additional program per week - a performer, a movie, an event on the library lawn, etc. etc. When it came to our finale, I had a few options. With the construction happening right outside the library, it wasn't really feasible to hold the program on the library lawn or in the library itself. However, National Night Out was August 1st this year, so we simply scheduled our finale to occur within the regular National Night Out events our city was already going to hold. This means there was food, drones to watch, games to play, music, and other items going on - none of which I had to plan myself. 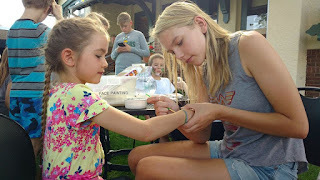 I was only responsible for the library's table at this event, and we brought back the teens and their excellent face-painting skills because the teens and the kids both enjoy it and we already have the face paint, brushes, etc. I would call this event a rousing success, mainly due to the small amount of planning I was responsible for at the very end of a long summer. This was another program that fell into the category of "easy to set up, easy for someone else to run." I brought out our rather generous supply of sidewalk chalk and let kids draw on the library sidewalk. I didn't have any problems with kids drawing anything inappropriate, and the next big rain storm will erase the artwork. Until then, our sidewalks serve as a reminder to all of our patrons that our library is a fun place that welcomes children. 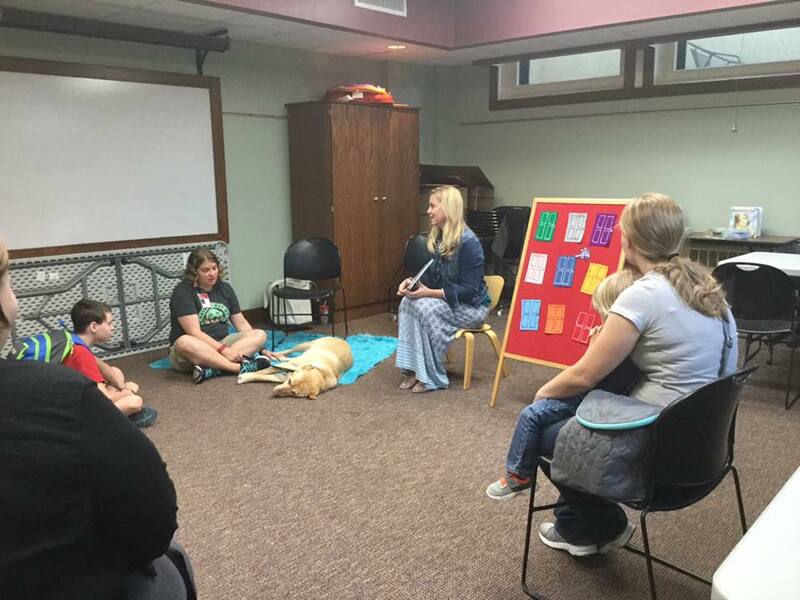 My library, like many others, has a "read to a dog" program that happens once a month. Unfortunately, many people have forgotten or never found out that this exists, so this summer our dog handler and I decided to change that with a special dog-themed storytime. I read a couple of dog books, then we had a local author read her dog picture book, and finally the kids were able to meet Honey, the dog who comes to the library once a month. I told the parents about the program and the kids enjoyed getting to know Honey. We're hoping that this will encourage more caregivers to sign their kids up to read with the dog this fall. One of my goals in creating programming for this summer was to do things that are simple, cost-effective, and easy to replicate at home. Another goal was to make sure my programs would be doable by staff if I were to be sick on the day of a program. One week we did bubbles on the library lawn. I bought several gallons of bubble juice and brought out the library's bubble machines, pie plates, yarn, and straws. 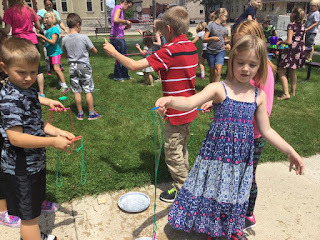 While the two bubble machines were running, kids could make their own bubble wand by stringing half-straws onto a piece of yarn and then tying the ends together. This loop of yarn became a giant bubble wand with straw handles, and kids dipped it into the pie tins so they could blow big bubbles. We did run out of bubble juice toward the end, and several kids ran inside to make their own bubble juice using the library's bathroom soap and water, which I didn't mind except for the mess that was left in the bathroom. 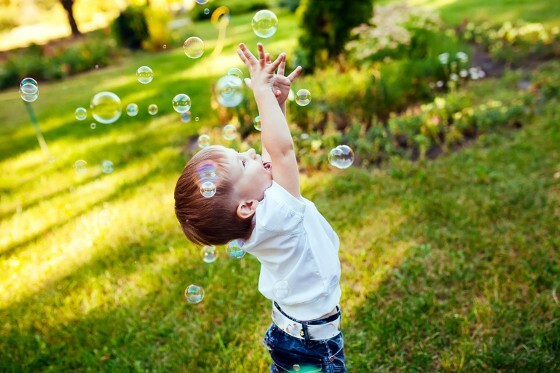 In the future, I will probably buy some Dawn dish soap and have it available as a backup in case we run out of bubble stuff, and I'll ask my staff to watch the bathroom for kids who are being inventive. Overall this was a very fun program that worked well for a variety of ages and required very little set up. 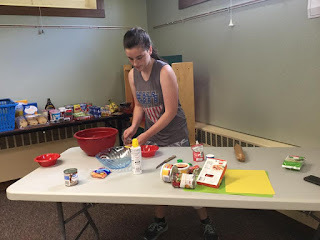 Our teens had their regularly scheduled monthly programs this summer, and one of them was a food challenge I'd been wanting to do for a long time. I set it up similar to a television cooking competition. Each table had several mixing bowls, one knife, and two cutting boards. I set out a variety of other kitchen tools for the groups to share. Since our library doesn't have a full kitchen, I made sure the microwave and toaster oven were plugged in and ready to use. 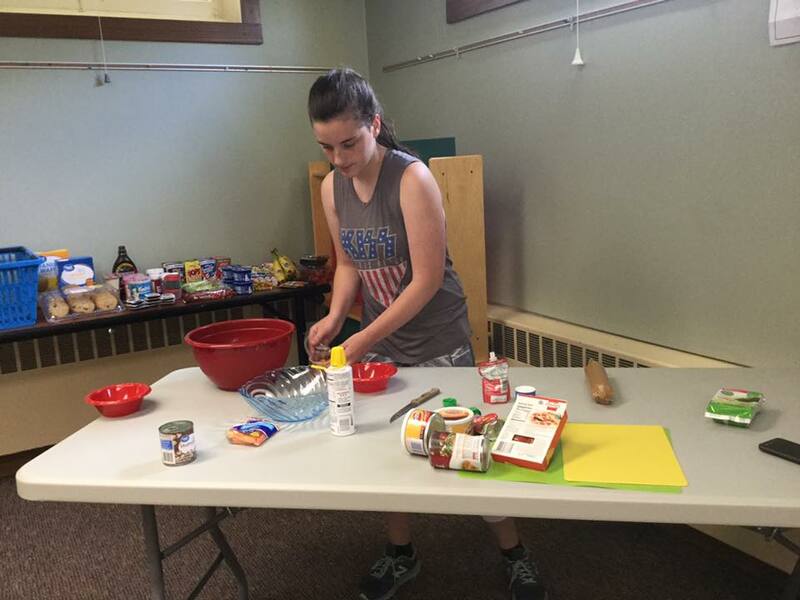 I purchased a variety of food items for the teens to work with, and divided them into three groups: snack, dinner, and dessert. The teens could use items left over from previous rounds, but couldn't access the new food choices until we got to each round. As they "cooked" (I use this term generously because one teen used some hot water and one microwaved a piece of S.pam, but other than that no one actually cooked anything), I walked around and asked them about what they were cooking. When I called time, I had them describe their dish, then everyone got a chance to taste it. I managed to survive the night without tasting any of their creations, and I'm sure my stomach is grateful. If I were to do this program again, I think I would specify what types of things their meals needed to include or given them a goal to aim for like having everyone make a sandwich or a salad. Obviously it would also be nice to have a kitchen to work with, but it's possible to make a pseudo-kitchen out of small appliances. One of the most popular programs of last summer was our library obstacle course. 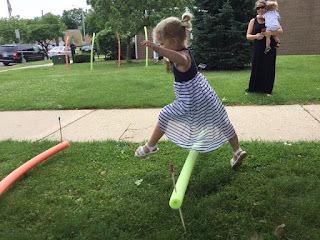 We set up an obstacle course on our library lawn using pool noodles, hula hoops, and other common items, and kids really enjoyed running through the obstacle course. One of my young patrons made a point to suggest to me not once but several times that we have another obstacle course this summer. I set up an obstacle course using the same items as last year. There were two tunnels to crawl through, pool noodles to zig zag around, pool noodles to jump over, hula hoops to jump in, a yarn "laser maze" to crawl through, etc. etc. I mapped out what I was doing beforehand and it took maybe twenty minutes to set up the course. Then kids lined up and went through. Most of them went back and did a second (and third and fourth and tenth) round through the course. This type of activity is a great one for utilizing volunteers. If I could have borrowed the high school football team, for example, I would have stationed one of them at each event in the course to assist/demonstrate/encourage the kids going through it. 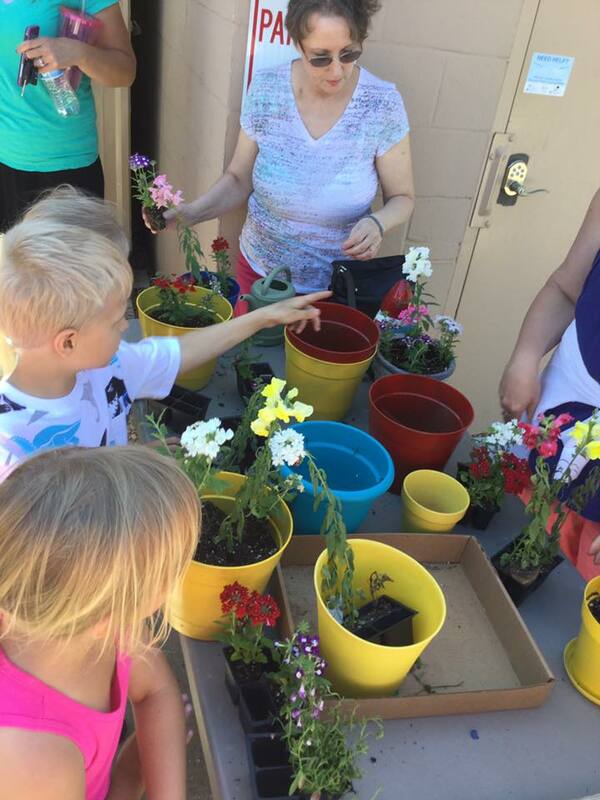 This summer we were able to partner with our local senior center to create a butterfly garden. We met over at the senior center and read a book about the life cycle of the butterfly, then we headed outside to plant some flowers. 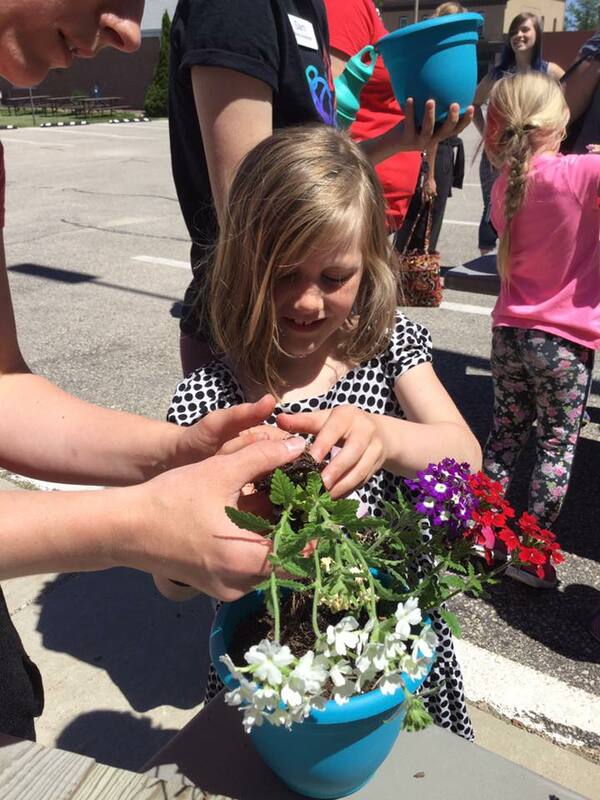 Seniors, kids, and caregivers worked together to plant flowers in individual pots, water them, and set them in our new garden area. We are hoping to get a bench for the area later on. All of the flowers, pots, soil, etc. were donated from local garden centers, so this project did not cost anything for our library or for the senior center. Partnerships like this are a great way to get people who don't visit the library to remember that it is available as a resource for them. Now that our summer reading program is finished, I can finally explain the things I did at my library this summer. I ended up being really sick on the day of our kickoff event, so I missed out on all the fun. However, aside from a table for people to sign up for summer reading, the rest of these things were run by outside groups and didn't require much staff involvement. There were enough different things for people to do that they could enjoy themselves, and no one felt like they had to stay on the lawn for the entire event, either. Events that are easy on our staff and enjoyable to our patrons are a win-win in my book. Looking back at the end of summer, I can't think of anything I would do differently, except for not being sick. How was your summer kickoff? Are you making any changes for next year?